As a long term user of hearing aids, there are two main areas of listening that still prove a challenge – group conversations and TV programs. These notes refer to the latter of the two and document my efforts to find a solution. There are a number of “TV listening devices” on the market and research narrowed my preferences down to two; these were the Geemarc 7350 OptiClip and the Amplicomms TV 2510-NL. I found supply of the latter to be very limited and even when apparently available, it was flagged as “Pre-Order”. As it happens, I have had a Geemarc telephone for many years and their product seemed more freely available, so it was my choice to go for the Geemarc version. I purchased the CL7350 from “actiononhearingloss.org.uk”, firstly because I have had experience of this organisation having participated in some of their “hearing campaigns” and also because they had the item in stock. 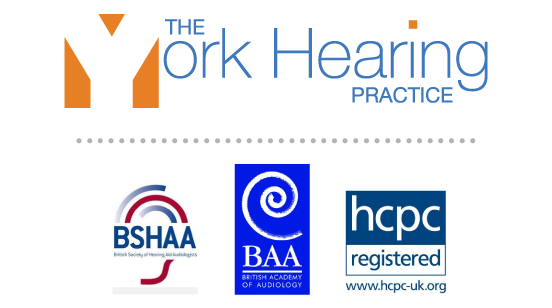 Interestingly, if you have a genuine hearing loss, you can purchase these items free of VAT. Knowing what you want from this type of equipment isn’t always obvious, but I had some very specific selection criteria…..
1. The device should accept audio output from the TV via a digital(optical) link (most modern TV’s have one) as it produces a clearer and cleaner sound. 2. Most TV’s also have a headphone output, however if you use this the TV usually mutes it’s own speakers….bit inconvenient for other people in the room. 2. No wires trailing across the room and the ability to get up and move freely without getting tangled up. There is a downside to this, as it involves batteries, which have to be kept charged (more on this later). 3. The ability to use the device and still hear conversations in the room – and equally not have conversations in the room drowning the TV sound. It should be noted that most of the information conveyed here is probably also true of most other brands of this type of hearing accessory – but I cannot guarantee this. 1. The transmitter sits near the TV, connects to the TV via a digital audio cable (supplied), connects directly to a mains power socket, and has a cradle to house and charge the receiver when, the latter is not in use. This can sit hidden behind the TV and be unobtrusive. Once connected you can pretty well forget it’s there. 2. The receiver is wire-free and travels wherever the carrier goes until they want to take it off. Included as standard, are a pair of ear bud headphones and these two components are all you need for improved TV listening. When not in use, the receiver sits in it’s cradle on the transmitter where it’s battery can charge. The receiver also has a built-in microphone so that it can pick up room conversations through the headphones, and a large toggle button on the front that enables the user to cut-out TV listening during a conversation. 3. The audio output on the receiver provides the user with alternative listening options. In addition to the headphones mentioned in (2), a locally positioned battery powered speaker on for example, a coffee table at the side of the listener; can be used instead of headphones – however, this may not suit some people. Other options specifically for hearing aid users with aids that have a telecoil option are to purchase one or more additional items (as I did). 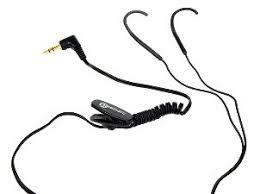 These are a neckloop and/or ear hooks and either connect to the audio output on the receiver. 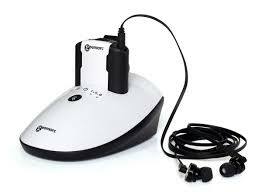 These are fully mobile, offer good quality audio, and the telecoil on most hearing aids these days also picks up general conversation and audio. I purchased a Geemarc Iloop+ neckloop and also Geemarc CL3 ear hooks, both of which are discussed later. 1. First of all, a good read and study of the instructions and diagrams…..not always the clearest, but these were fairly detailed and some of the detail is just repeated here (in a better sequence I hope!). 2. Connection of the transmitter to the TV was my first action. I had already checked the TV to ensure it had a Digital Audio (Optical) Out connector. This is a small squarish socket on the TV and on my TV had a little flap. I had to rotate the plug round to get the correct alignment, but then it connected to the TV easily enough. If the TV does not have a Digital Out, but has AV out sockets (Red & White). This is also a good quality output that does not affect the TV speakers and for a few £s, you can get an AV to 3.5 jack plug cable (both ends should be male pins) which you can connect to the Audio In socket on the transmitter. 3. Whichever cable you use, connect the other end of the cable to the rear of the transmitter. The Digital Audio cable connects to a similar squarish socket, or if using the AV adaptor cable, the 3.5 jack plug connects to the blue AV In socket. 4. Connect the power plug to the mains and the transmitter , switch on the transmitter (switch at rear), and that’s the basic setup complete and you can now more or less forget about this part of the technology. 5. The receiver can now be dropped into it’s cradle on the transmitter to be charged up (check it is switched off). When the charging light has changed from red to green, the receiver is ready to use. 1. First of all, some operating specifications. The transmitter has a range of upto 25 metres so you can wander away from the TV (to make a cuppa!) and still listen to the audio from the TV (I found this very useful). Secondly, the battery life of the receiver (between charges) is upto 6 hours (which easily gives me an evenings viewing). Thirdly, the transmitter supports multiple receivers (which can be bought separately) – so multiple people can benefit from improved audio quality. 2. Supplied in the box, is a small (about 6 inches long) 3.5 jack plug cable. Plug this cable into the audio socket on the receiver, and then plug your chosen listening device into this cable. Without going into a detailed explanation, it provides a more reliable connection. 3. The simplest use is to just plug the headphone jack into the receiver, switch it on, insert the earbuds, and away you go. I used a pair of cheap headphones (I already had) that sit over the ears as I have never cared for ear buds. My headphones fitted over my ears with my Phonak Virto in-the-ear hearing aids still inserted and on the standard listening program. This actually provided a much improved TV listening experience and I was able to listen and follow a full episode of the “Good Karma Hospital” (no mean feat). I was also able to hear conversations in the room reasonably well. 5. Note that with multiple receivers, although the transmitter allows the connection of two receivers at the same time, which may be very useful to some people – you can only re-charge one at a time. I have tried out one of each of these options and there are a range of manufacturers and products all very similar. However, my comments here relate specifically to those I have tried myself, and other versions may provide better or worse results. 1. My marginally overall preference is the ear hooks. I had some concerns about these before purchasing as there were customer comments about the fragility of them, with either the hooks breaking or the cord snapping. The design and construction is very lightweight, but they do not feel as if they will break if I treated them for example, as one might treat a pair of wire framed spectacles. They sit comfortably behind the ear, the sound quality is good, they take their power direct from the receiver, and they are unobtrusive. Only time will tell about their reliability, but I am prepared to test it out. 2. Difficult to say which comes next as both have pros and cons. There is a vast range of headphones available. Mine were cheap and cheerful and the sound quality was good. The main benefit of this option is that it does not require a telecoil or hearing aids. The downside is they are not as unobtrusive as the other two options. 3. 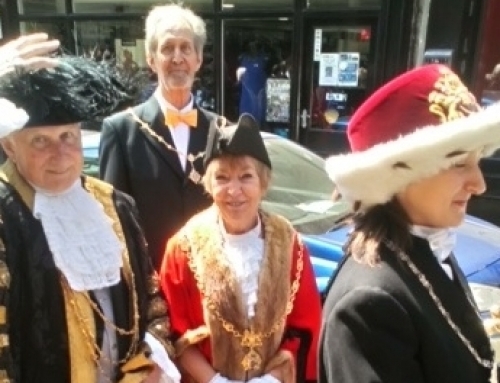 So….that leaves the neckloop in third place, which seems a bit harsh as it works as well as the others. The biggest downside on this particular loop, is that it is battery powered, whereas the other two options only have the battery in the receiver. I suspect from my research, that there are neckloops that do not need the battery but their descriptions tend to try and push you to each manufacturers version of the TV-link and for me, what I have tried works. I am pleased with my choice of the 7350, and all the add-on options. They all definitely improve my TV listening, and while I prefer the ear hooks, I have two backup options that work well. I would just caution that there are still some TV programs that defy understanding regardless of your hearing quality….and sadly this is only going to be resolved by the program producers. The total costs (Vat free) were £83 for the 7350, £33 for the Iloop+, and £18 for the Ear Hooks. A postage charge needs to be added (about £7). There is an alternative neckloop at £16 which I may be tempted to try out in the near future. I quite like the locally attached speaker concept, but the sound obviously comes in at your side rather than from the TV direction, which is a bit off-putting (and it irritated my wife).